There is a great drawing app that rose to the top of the ‘most used’ list here because of it’s paint brush tip for writing and drawing. The writing apps we have covered here all produce a regular, pen like, line as you draw or write. ArtStudio’s drawing line is much more like a paint brush. It is an app for drawing and painting so it makes sense, but it is still a feature most often pointed out when there is someone looking over our shoulder as we use the app. If you use ArtStudio for writing a bit of text you get a paint effect like customarily seen in Japanese lettering or Calligraphy. Beyond this simple visual item, the app makes it very easy to draw, shade and fill. With it’s quick pop up (raising from the bottom of the screen) tool options, we are using this for working with a group more than the specialized ‘whiteboard’ apps. It is like carrying your full collection of whiteboard pens to every meeting. Then, being able to share that big wall board out to everyone… much better than the pictures of the whiteboard so often used. 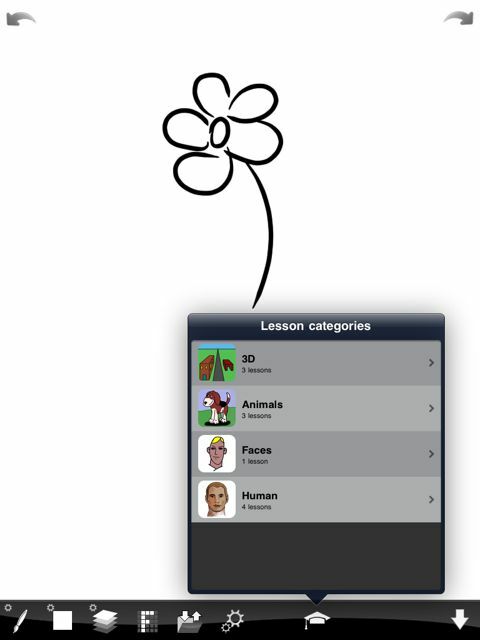 In the latest update to ArtStudio, a group of Drawing Lessons are included. Showing step by step instructions for drawing a variety of images, animals, faces, humans and 3D perspectives. You can work straight through the lessons, jumping back and forth if you need to practice a bit. Maybe this will help us with our whiteboard pictures where people start guessing what we were drawing later like a ongoing pictionary game. Should be a hit with the kids too as they have a never ending pad of paper to draw on and have fun learning.